Anything you can do, I can do better. 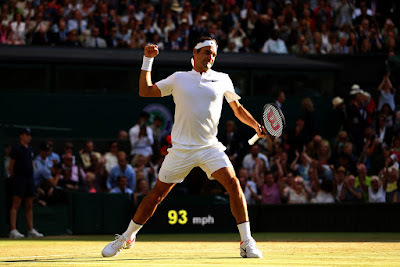 That was the way of Roger Federer on Wednesday when he produced an exquisite display of grass-court tennis to keep alive his quest for an eighth trophy at The Championships, Wimbledon. In his 100th match (89-11) at the All England Club, Federer gave last year’s finalist Milos Raonic, the No. 6 seed, few opportunities to break in a 6-4, 6-2, 7-6 (4) quarter-final victory on Centre Court. Watched by fellow tennis royalty Rod Laver and Ken Rosewall, the third-seeded Swiss superstar exhibited his full armoury in striking 46 winners and committing just nine unforced errors. He will next play No. 11 seed and 2010 finalist Tomas Berdych in the semi-finals on Friday. Federer leads their ATP Head to Head series 18-6. “I'm playing very well. I'm rested. I'm fresh. I'm confident, too. Then great things do happen. Confidence is a huge thing. I can't believe it's 100 matches, it's a lot but I'm very happy my body has kept me going all these years,” Federer said. With his closest rivals, World No. 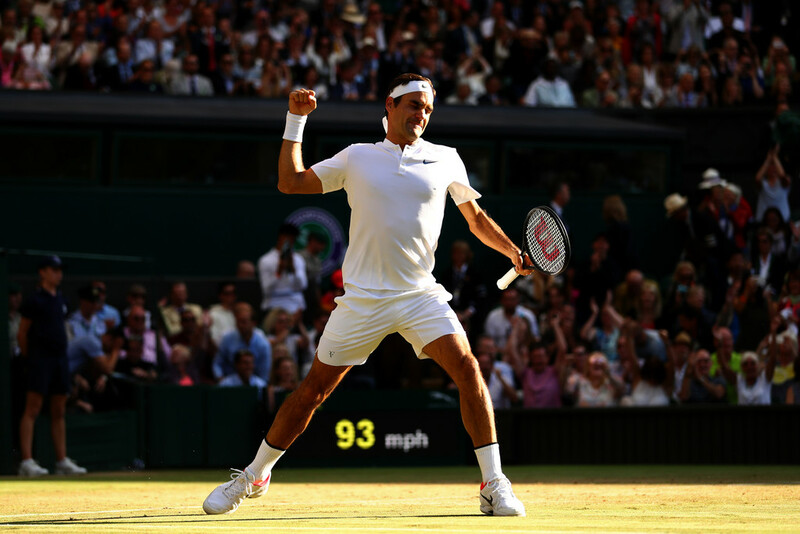 1 Andy Murray and Novak Djokovic, losing at Wimbledon on Wednesday, the stars are aligning for Federer in his attempt to capture a record eighth crown. 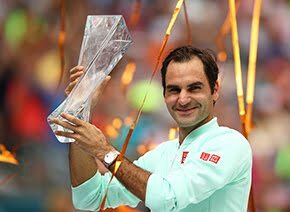 Should Federer lift his eighth Wimbledon trophy on Sunday, he will join Rafael Nadal as the second qualifier for the ATP Finals, to be held at The O2 in London from 12-19 November. 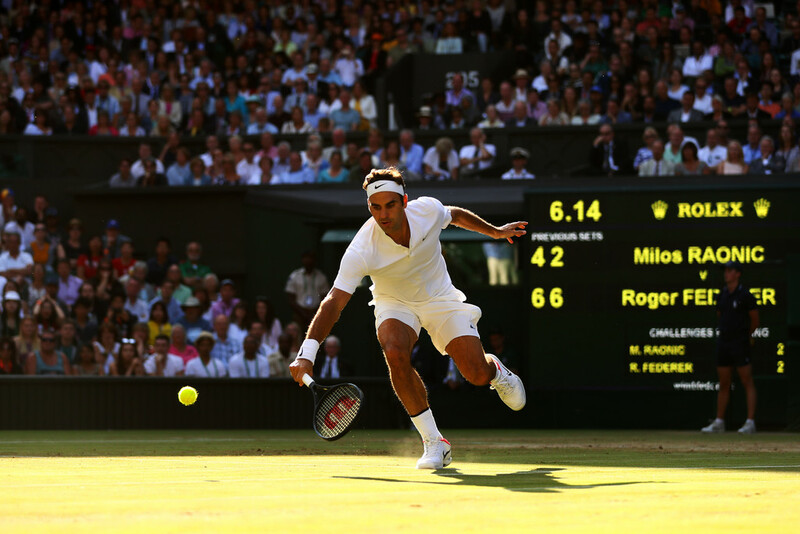 Federer, who has resisted the temptation to hit body serves at The Championships this year, aiming for placement over sheer power, kept Raonic on the stretch throughout their one hour and 58-minute encounter. Quick to the net in order to take time away from Raonic, Federer first broke in the fifth game with a running crosscourt forehand winner and later clinched the set with an ace. Raonic was given little respite as Federer lost just two of 30 service points in the second set, which included 13 winners. Breaks of serve in the first and fifth games, kept Federer on the front foot as he won seven of the next nine games from a 5-4 first-set lead. Through two sets, Federer had committed just three unforced errors. “I saw things very well. That helped me returning his serve as well. From the baseline, I felt like I had the upper hand, which wasn't necessarily the case last year, which helped me to stay more calm,” Federer said, comparing Wednesday's quarter-final match to their semi-final contest last year, which Raonic won in five sets. Federer did not have things his own way in the third set, coming close to a 0-2 deficit, but for quick work in moving Raonic out of court at 30/40. The Canadian then pressed in the eighth game, but was unable to convert four break point opportunities. Without any tangible success, the pressure could have mounted on Raonic. In an inevitable tie-break, Raonic came close to a 4/0 lead, but two aggressive groundstrokes, a reflex forehand volley, a backhand drop volley and forehand winner helped Federer to five straight points for a 5/3 advantage. 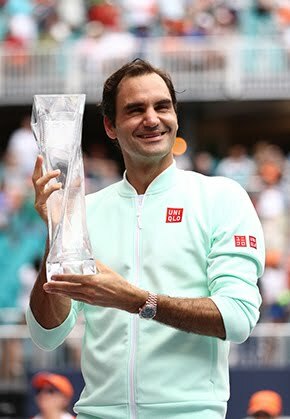 Federer smiled patiently at the suggestion that with three unexpected names in the last four, some now regard him as a near-certainty to lift the trophy on Sunday. “Being the favourite or not the the favourite doesn't matter,” he said. “These guys (Tomas Berdych, Marin Cilic and Sam Querrey) are all big hitters. They will have their word to say on the outcome of the matches. They've got big serves, big forehands, big hitters really. All three guys are taller and stronger than I am. I have to figure out a different way, carve my way through somehow with my slice and my spins, my consistency maybe.